Severe weather conditions can damage your roofing system, but the usual cause for flat roof damage when it comes to weather is caused by hail. If your roof gets damaged by hail or any other kind of debris, it becomes weaker. Piling snow, heavy rains and similar weather conditions can cause serious and major problems for your whole property if your roofing system can’t protect it adequately. Freeze-thaw cycles can seriously damage your commercial roofing system membrane. Professional maintenance and inspection is the key for keeping your roof in the best condition possible. If it comes to irreparable damage, it is vital to replace your complete roofing system as soon as possible. Severe hailstorms can damage your roofing system without causing visible damage. That can lead to problems with roof and structure integrity. Punctures and cracks can be so small that untrained and unprofessional eye may not notice, but they will stay there and over time they will shorten the lifespan of your roofing system. Severe hits by hail can cause depression of the roofing membrane and that can lead to future cracks. Your insurance company will most likely deny you the settlement for that kind of damage since they might view it as just “cosmetic.“ On an experienced roofing professional can determine the real extent of damage your roofing system has suffered when it comes to damage caused by a hail and recommend you a proper program for maintenance and repairs if needed. If your roofing system is in excellent conditions, it can protect you from extreme temperatures like heat and cold. On the other hand, if your roof is damaged by hail, those temperatures in combination with moisture can severely damage your roofing system. During snow or freezing rain, water and moisture can enter the small crack in your roofing membrane. When that water freezes, it will expand and small crack will become much bigger. Freeze and thaw cycles are nothing to joke with. That process will continue until you take action and contact a professional roofer to seal the cracks. Regular roof inspections are recommended even if there were no recent storms in your area. Trained professionals will quickly detect any problems your roofing system might be struggling with. Identifying those potential problems before they evolve into more serious issues. Taking care of damage caused by a storm as soon as it happens will save you huge amounts of money over time. A roofing professional can determine whether the extent of damage caused by a hail is repairable or whether your property needs a brand-new roofing system. Coating your roof with quality applicants can protect your roofing membrane and prolong your roofing system’s life by filling in the cracks caused by a hailstorm. Coating applications are also useful for moisture protection. If you want even more protection, then you should consider installing a single-ply roofing systems such as PVC, TPO or EPDM systems since they provide a puncture-resistant and durable solution. 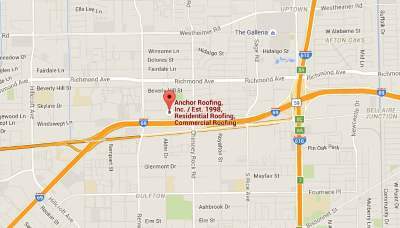 If you have any more questions, do not hesitate to give us a call, your professional Commercial Houston roofer can solve all your problems when it comes to your roofing system. Great information! Hail can cause a lot of damage to flat commercial roofs, sometimes it is hard to spot if not inspected by a professional. It is very important for a building owner to have his commercial roof inspected as soon as possible after a hail storm, to prevent future damage.